Leather bags have many advantages compared to other materials. They are more durable and wear resistant, does not absorb moisture. But still they are not permanent and require special care. First of all, the bag must be able to properly use it. Despite the fact that natural leather is moisture, she is still afraid of her. So you need to treat it special protective equipment. It can be lotions, sprays, etc. But before leaving the house, you need to wait for the complete drying of the protective agent. If all the same bag has been in the rain or snow, do not rush to dry it on the radiator or a Hairdryer. She dries at room temperature. On a leather bag the negative effects of direct sunlight. This is especially true of colored bags, as they can burn. So minimize this impact. Eliminate mechanical effects, the skin still a natural material and any scratches or other damage will remain invisible. If a leather handbag you are using is not constant, but seasonal, keep it should be in a carton or cloth bag. In any case, do not store bags in polyethylene, they can dry out. Sooner or later the bag may be subjected to contamination and must be put in order. 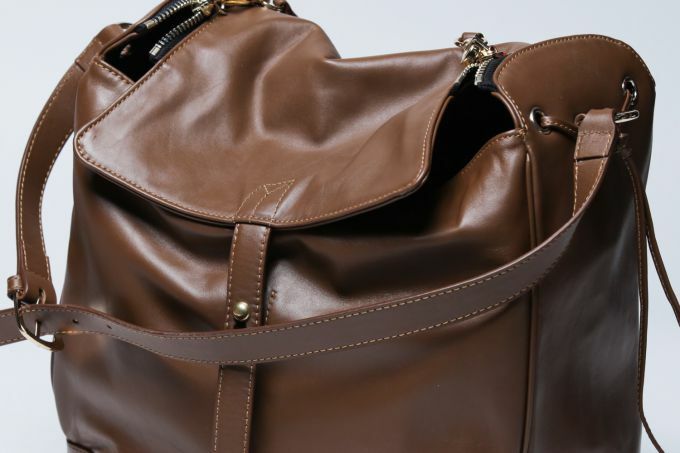 So how to clean leather handbags? - do not attempt to scrub any contamination by abrasive materials and tools, whether rough sponges, sandpaper, or various brushes. If the bag was just covered with dust, then it will be enough to wipe it with a damp cloth, and then apply the cream. For more serious contamination make soap a bit warmer than room temperature, soak in it a cotton ball or cloth and gently RUB the stained place. If your bag someone signed with a pen, it's good to cope with this problem will help lemon juice. And remember, if you are sure you can cope with pollution without damaging your bag, take it to the dry cleaners. To maintain the elasticity of the skin, it can be cleaned with milk. Lemon juice (black bags), coffee grounds (brown and black bags) will help to regain its former luster. Wiping onions, castor oil, ammonia will refresh the color and add Shine. The most efficient among the available tools is glycerin, which you can easily buy at the drugstore. If you do not trust home care, it is always possible to purchase specialized care products and color of handbags made of genuine leather in the store.